APM Terminals has signed a two-year, €5 million ($6.23 million) contract with Amsterdam-based NV Nuon Energy for the supply of environmentally-sustainable wind-generated electricity to power the new APM Terminals Maasvlakte II cranes and container handling equipment. The new 2.7 million TEU annual capacity deepwater terminal, scheduled to receive its first commercial vessel call later this month, will reportedly be the world’s first container terminal with zero emissions on site and off site. The contract term begins January 1, 2015. APM Terminals’ Maasvlakte II terminal was already positioned as the first terminal worldwide with zero emissions on site, through the electrification of all its quay and yard cranes and the innovation of a fleet of 37 electric battery-powered Lift-Automatic Guided Vehicles (Lift-AGVs) which will transport containers to the yard from the quay With the contract with Nuon, APM Terminals now pushes it ambition further in the power supply chain, by adopting 100% power supply by European windparks on- and offshore. NV Nuon Energy is one of the Netherlands’ three largest energy companies, and is part of Sweden’s Vattenfall A.B., an energy producer which is wholly-owned by the Swedish government. Vattenfall produces electricity from nuclear power, natural gas, biomass, coal power and hydro power as well as wind power, which accounted for 3.7 terawatt hours (TWh) of electricity for the company in 2013. “We are very proud of our technological advances in making this the world’s first zero-emission terminal operation to improve the port environment and set the industry pace in sustainability,” said APM Terminals Maasvlakte II Managing Director, Frank Tazelaar. APM Terminals has also leased 35 e-NV200 electric vehicles from Nissan for the transportation of personnel and staff at the Maasvlakte II terminal. The order includes 16 of the Evalia model, with five seats and storage, which will be used primarily to ferry operators to and from job locations within the terminal, and 19 two-seater vans for Technical Asset Management, the Reefer department, IT, Security and other deployments. The battery charged range of these vehicles is more than sufficient for operational use at the terminal, at 140 km (90 miles) under normal road conditions. 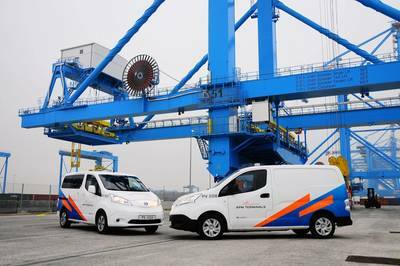 APM Terminals will be among the very first users of the e-NV200,which feature very low noise levels along with zero emissions, in the Netherlands.